For 143 years, the exclamation point of Carlisle Memorial Methodist Church's spire has punctuated the skyline between the communities of north Belfast and the city centre. Its enduring, defiant appeal will be on full display when the Prince of Wales and Duchess of Cornwall visit as part of a two-day trip to Northern Ireland. But, beyond the striking gothic revival arches, is a story of a church brought back from the brink of total ruin, a remarkable renaissance that has been 10 years in the making. "There's light at the end of the tunnel," says Shane Quinn, from Belfast Buildings Trust, which acquired the church in 2011 after launching a major campaign in 2008 to promote its regeneration. Just six years ago, he said, an engineer reported that the church was dangerous, its roof ready to collapse. But, in 2015, phase one of the church's regeneration allowed it to be reopened to the community. It has since played host to events such as beer festivals, concerts and even performances of a specially-written musical history of the city - The Belfast Opera. Now, the trust is looking to the future - the announcement of a long-term tenant to take on the building should be made by the end of this year. "The building has already been saved," said Shane. "Big historical building projects always take time. So we're very pleased to be actually exploring what will happen in the future." Like much of Belfast's architectural heritage, the boom-and-bust fortunes of Carlisle Memorial match those of the city. The church was opened in 1875 and was designed by WH Lynn, a one-time partner of renowned architect Charles Lanyon who built Queen's University's Lanyon Building and is responsible for much of Belfast's built heritage. WH Lynn was no slouch himself though, having designed and created not only Carlisle Memorial but also the Bank Buildings and Campbell College. The church was paid for by James Carlisle, who, according to Shane, came from "humble origins" but made his money in linen. It was designed to be a memorial to Carlisle's two children who died as teenagers. "Both he and his wife Mary wanted to make it a gift to the city," said Shane. "It was a very untypical Methodist church," he added. "It became known as the Methodist cathedral, people from all over the Greater Belfast area would travel to worship there." However, the church's fortunes waned along with the city, which slid from industrial powerhouse to sectarian tinderbox. It was the Troubles, and Carlisle Memorial's location at the one of the most conflict's most notorious interfaces between Catholic and Protestant communities, that cemented its descent into dereliction. The church's congregation diminished so much that by 1982 it shut its doors as a place of worship. Shortly afterwards, it was bought by the Ulster Provident Housing Association and used briefly as an artists workspace but by the mid-1990s the building fell out of use and into total disrepair. "Carlisle Memorial is a very important story of civic decline," said Shane. "It's a gateway to north Belfast and communities that suffered very significantly. But it's also a symbol of the confidence and ambition that Belfast once had - that it has always had but is rediscovering." The building continued to rot until the Belfast Buildings Trust got involved in 2008. 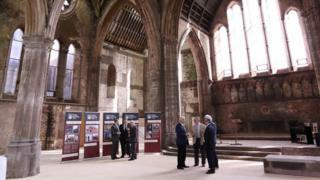 However, it was Carlisle Memorial's inclusion on the World Monuments Fund's list of the world's 100 most endangered historic buildings that really pushed its regeneration into full gear. Now, the trust is building towards a new future that will take in Carlisle Memorial's 150th anniversary and beyond. While the building has been open for one-off events, there will be a "core tenant" to take the building forward. "Over the last 10 years, three key themes have emerged in talking with the community - music, food and general health and wellbeing," said Shane. "Perhaps one day you could see weddings and all sorts of community events happening, so there'll be a mixed use. But there'll also be a core tenant and a core purpose. "What happens to the building in the long term will be determined by the community. "It's been a big project and like all big projects it's two steps forward and one step back. But it's wonderful to get to this point. "The church was a gift to north Belfast and we want it to fit that purpose."